Join the discussion on our forums! Come discuss Leyline Manipulator over in our dedicated Leyline Manipulator discussion topic. Does anyone know if there is synergy between Leyline Manipulator and cards drawn from stolen deck by King Togwaggle ? 2.) This card doesn't allow for a better infinite damage combo than the combo in quest mage. You have to spend 10 mana to set the Simulacrum OTK up, and you can only do so when you have drawn most of your deck to find both copies of Simulacrum and a copy of Leyline Manipulator. Quest Mage is weak in the early game, but it doesn't have to waste 10 mana to get the combo pieces it needs. The ordering of the combo pieces drawn is also much trickier to manage for the non-quest exodia. Meanwhile, most of the time Quest Mage is using random spells defensively to survive, and Quest Mage can can play a partial combo to try and draw into its missing pieces. People have pointed out that the non-quest exodia can run extra early game defense and that it gets an extra card in the mulligan, but I don't think this is enough to save it. Because of the combo pieces needed for the OTK, and a need for extra combo pieces for consistency, there is really only room for 2 copies of Frostbolt in non-quest exodia lists that Quest Mage doesn't get. 3.) 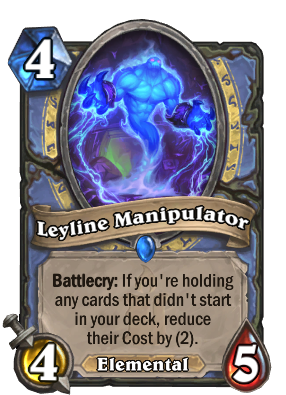 There isn't room for Leyline Manipulator in standard quest mage lists. Quest Mage doesn't have room for this card because it already runs 30 cards that it needs, and this can't replace any of them. Quest mage needs its combo pieces, card draw, freezes, and spell generation, and while a discount yeti would be helpful, it doesn't do enough to help get the combo online. Quest Mage would rather play frost bolt, and it doesn't even have room for it. You could try and play an elemental version of quest mage, but it would be much less efficient at getting the exodia combo online. Quest mage will be disgustingly strong. I actively despise whichever cretin signed off on this card. WHY IS IT ON THE YETI CURVE WITH SUCH AN INSANELY POWERFUL BATTLECRY? This expansion is over, Priest and Mage are going to destroy the show and make Gadgetzan's meta look fun. Whoever designed this card, Temporus, Psychic Scream, and Duskbringer have ZERO comprehension on what constitutes for fair game balance or simply healthy gameplay. I hope I get this card. Quest Mage should be even more fun, though still would need to get the Quest Mage legendary for that. It's worth a mention it's 4 attack we have seen a few 4 attack minions that's the magic number priest don't like, we have also seen a few 1/1's and that's the magic stats evolve does not like, so under the hood of this set are some subtle "nerfs in air quotes" I think that was a clever way to handle it. I like the wording on this card you are gambling away your early game for a stronger mid game. I think it might be to strong if your bless RNG is strong, and very good if your Bless RNG is bad, so no real drawback to playing this in every mage deck. Super broken card, with vanilla stats, + ALL generated cards are discounted not just spells. so mage identity is casino now eh ? So all mage archetypes just got large boost. As a mage player, love to see this. Ethereal Peddler for mage spells. With decent vanilla stats and the elemental tag. This is a pretty broken card. Yeah but most of the time it will be spells. What about apprentices made by simulacrum? Like I said, MOST of the time it's going to be spells, from the likes of babbling books, tomes, glyphs, spellstones, couriers, tempests, etc. But yeah It would also be good for minions like fireflys, pyros and simulacrum. The fact is It's a broken card.